The IAAR Faculty Fellowship supports research by UNC-Chapel Hill faculty who are pursuing rigorous projects that focus on African Americans and others of African descent in the world. Projects demonstrate engagement with timely approaches, theories, and methods as well as policy and public interest. The fellowship is open to full-time clinical, research, tenured and tenure track faculty in the any discipline. In addition to receiving funding or course buy-outs, fellows are housed at IAAR for a semester or academic year. They also give one public talk about their research during the tenure of the fellowship. Professor Nguyen, an Associate Professor and Associate Chair in the Department of City and Regional Planning, has been selected for IAAR’s Faculty Fellowship for the 2018-2019 academic year. 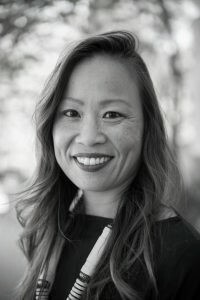 Nguyen’s research focuses on housing policy, social and spatial inequality, and resilient communities. During the fellowship she will complete a book manuscript for her project, In the Shadow of Ferguson, which explores the ties between the 1896 Plessy v. Ferguson Supreme Court ruling and the 2014 shooting of Michael Brown by a police officer in Ferguson, Missouri. Using a structural analysis that examines racism and inequality, the study documents over 100 years of critical events relating to housing and urban policy in St. Louis, Missouri. Professor Nguyen will give a talk on her research in Fall 2018. Professor Ifatunji received the Faculty Fellowship in support of his project, The Political Incorporation of Black Immigrants. During his fellowship, Professor Ifatunji will collect pilot data to support an application to the National Science Foundation, Time-sharing Experiments for the Social Sciences (NSF TESS: http://www.tessexperiments.org). The study will assess African American support for Black immigrant political candidates and the degree to which the racial context of political campaigns influences support. More specifically, the study will ask African Americans to evaluate Black immigrant candidates relative to both Whites and African Americans. While a Faculty Fellow with the IAAR, Professor Andrea Benjamin will complete data collection and data analysis for a project exploring how minority representation in a dominant governing body impacts minority citizens. Focusing on the extensive participation of African American candidates in Durham, North Carolina elections and governance, Benjamin’s research will contribute to her book manuscript on co-ethnic electoral coalitions. During her fellowship, Professor Chérie Rivers Ndaliko’s will conduct research toward a book and documentary film, exploring music and cultural activism. Ndaliko’s work on the musical production of Congolese pianist and composer, Ray Lema, will focus on Lema’s music in the context of his life in exile from the Congo as well as the broad appeal of his music to a variety of postcolonial consumers. For the second year of the IAAR Faculty Fellows, we welcomed Frank Baumgartner and Wizdom Powell. Professor Baumgartner is the Richard J. Richardson Distinguished Professor of Political Science. As a fall 2015 fellow, he developed his study on the relationship between race and traffic stops in North Carolina. Professor Wizdom Powell held the Faculty Fellowship in spring 2016 while pursuing data collection for her study, “Mapping Therapeutic Community Landscapes to Reduce Substance Abuse Risk among Black Emerging Adult Males in Durham County.” In this project, Powell examined the relationship between neighborhood conditions, stress and substance use among black males in Durham. In the Faculty Fellows inaugural year, Professors Enrique Neblett (Associate Professor, Department of Psychology) and Alvaro Reyes (Assistant Professor, Department of Geography) held the first IAAR Faculty Fellowships. Neblett conducted a longitudinal study investigating the racism-related stress and health status of African American young adults. He gave a public presentation entitled: Racism and Mental Health: A Study of African American College Students during the Transition to Young Adulthood. During the fellowship period, Reyes developed his book manuscript on 20th Century Black and indigenous movements and thinkers. His Faculty Fellows’ talk, entitled Racialized Spaces and Public Places: Franz Fanon, Decolonization, explored theories of decolonization by Franz Fanon.